Written by chris maroulakos on Friday, October 24th, 2014 at 9:07am. It’s okay if you forgot about Michael Keaton. A household name in the ’80s, Keaton made his mark with hits like Batman, Beetlejuice, Night Shift, and Mr. Mom. But after transitioning into more thoughtful work like The Paper and Jackie Brown in the ’90s, Keaton largely disappeared from the limelight. His most notable appearances in recent years were as the voice of the Ken doll in Toy Story 3 and as the morally vague CEO in last year’s tepid Robocop remake, but none of that put the actor back on the map. So you may not have thought much about Keaton lately, and that’s fine. But after seeing his tour de force performance in the new film Birdman, you’ll never forget him again. Keaton plays Riggan Thomson, a washed up film actor trying to stage a comeback by writing, directing, and starring in a Broadway play. Riggan enjoyed A-list status in the ’90s as the star of the Birdman superhero franchise — obvious parallels here, though reportedly coincidental, to Keaton’s own history playing Batman — but now views himself as little more than the answer to a Trivial Pursuit question. He hopes his adaptation of Raymond Carver’s What We Talk About When We Talk About Love will put him back on the map, but he’s repeatedly hobbled by his unruly cast and his own unraveling sanity. That would be plenty of plot for most films, but there’s so, so much more to it than that. Directed and co-written by a top-of-his-game Alejandro González Iñárritu, Birdman is a thematically rich and emotionally dense work of art. There’s way too much going on to unpack it all here, but among other things, the film juggles the search for relevance, the failures of parents, the rivalry between Hollywood and Broadway, the vapidity of actors, the current superhero-centric state of cinema, and the unforeseen costs of achieving one’s dream. Every line of dialog is as purposeful and deliberately placed as a piece of glass in a mosaic, yet Iñárritu brilliantly counters all that emotional and contextual weight by making his film unrepentantly hilarious. Iñárritu also extracts career-best performances from his actors. Keaton has dabbled in drama before in Clean and Sober and One Good Cop, but none of those films hinted at the range, skill, and discipline on display here. Keaton’s Riggan is alternately delusional, brutish, sensitive, confident, self-loathing, manic, depressed, and, in some of his best scenes, struggling to barely conceal his desperation and broken-hearted need for admiration. The supporting cast is excellent as well. As Riggan’s pompous, pretentious costar, Edward Norton turns in his best work since 2002’s 25th Hour. And as Riggan’s daughter, Emma Stone captivates with her petulant yet ultimately graceful turn. Stone’s soul-baring exchanges with Norton sizzle, and a scene where she cuts her father to the core with a show-stopping monologue is one of the film’s best. Amy Ryan and Naomi Watts also get chances to shine, but if Birdman has a flaw, it’s that other prominent characters like Zach Galifianakis’ frazzled producer and Andrea Riseborough’s lustful actress are underdeveloped and inconsistent. Those shortcomings do little to distract from the fact that Birdman is a marvel to behold. Except for two sequences that bookend it, Birdman has no discernible cuts. Propelled by Antonio Sanchez’s jazz percussion score, the film moves fluidly from scene to scene in a way that echoes Riggan’s own scattered stream of consciousness and simulates the experience of watching a play. The result is like Synecdoche, New York by way of Panic Room, as the camera moves impossibly around the theater and through various other objects in a shining example of how CGI can be used to serve a story. Thanks to its dazzling camerawork, inspired direction, crackling screenplay, and incredible acting, Birdman is a triumph in every possible way. Its innovations move the entire medium of film forward, but it still takes time for complex character development and insightful observations about what it means to love and to create. It’s easily one of the best films of the year, and one you should see on the big screen in all its winged glory. 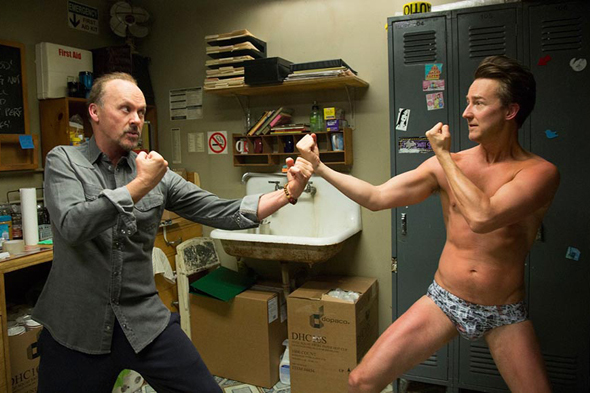 Birdman opens at Landmark’s Hillcrest Cinemas on Friday, October 24. Some scenes go on too long and other scenes involving supporting characters, may have been cut and needed to be restored. Also the pretentious cutting back and forth between drama and fantasy is as confusing and unsatisfactory as the time/space logic in INTERSTELLAR. That said, Keaton is truly amazing. Gonzalez I~arritu manages to extract a performance in Mr. Keaton which he himself didn’t know he had! I saw the film about of days before Thanksgiving and I was still thinking about it two and three days later. Keaton’s performance may be the best from an English-speaking actor on the big screen since . . . well . . . since Chris Bale in THE MACHINIST. Ed Norton is also very good. Keaton deserves the Oscar as well as Golden Globe and Norton a nom for supporting actor. Gonzalez Inarritu’s best film since AMORES PERROS.